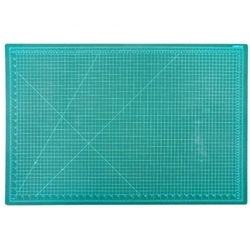 Bosolo - Self-Healing Cutting Mat - 18" x 24"
Home → Bosolo → Self-Healing Cutting Mat - 18" x 24"
This mat is a self-healing cutting mat which makes knife cuts disappear! it is 3mm thick with 3-Ply construction, and inch & centimeter measurements. Double faced so you can use both sides to protect your table and extend the life of your blade.